Largehearted Boy: Book Notes - Jesse Browner "How Did I Get Here?" Book Notes - Jesse Browner "How Did I Get Here?" 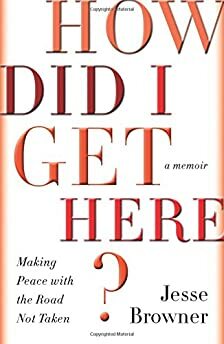 Jesse Browner's memoir How Did I Get Here? offers profound introspection into the life and work of the author. "There’s nothing glib about this self-help memoir. Full of Boethius and Rilke mixed with self-analysis, it's a beautifully written, erudite, and thought-provoking examination of the underpinnings of a creative life." How Did I Get Here? is a memoir in which I try to come to terms with decisions I have freely made that seem to have taken me in the opposite direction from my life's goals and desires as an artist, a father and a man. But it is also about the struggle, common to us all, to understand what it is we really want, rather than what we merely think we want, and how we move towards it without even being aware that we're doing so. My playlist assigns a song to each of the major historical characters – some famous, others not – whose lives I study in my effort to get to the bottom of this mystery. "Enter the Ninja," Die Antwoord. A.D. Harvey is a failed academic who famously invented a whole community of non-existent writers to praise his work. This song is also about someone pretending to be powerful, dangerous and mysterious when he's none of those things. "Hell Yes," Beck. Like Robert Frost in his poem "The Road Not Taken," in this song Beck is stretching his legs and enjoying the rewards of a positive attitude. "For Free?" Kendrick Lamar. David Rattray was a poet who engaged in the sort of unrestrained, foul-mouthed, socially conscious, 1950s-style Beat events that Lamar seems to be channeling in this song. "Digital Witness," St. Vincent. Like all great artists, the British sculptor Henry Moore created works that not only invite the gaze but stare back at the gazer. In this song, St. Vincent finds herself being interrogated, intimidated and subdued by her own television, which is how I sometimes feel in the presence of certain works of art. "Heroes," David Bowie. Like the lovers in this song, embracing in the shadow of the Berlin Wall, my wife's grandfather Abraham Buchman lived a life in which love and the politics of freedom were inextricably intertwined, to magical but also sorrowful effect. "You're So Vain," Carly Simon. I don't much care for this song, no matter who it's supposed to be about, but it seems to have been written very much with the American poet Jack Gilbert in mind. "City With No Children," Arcade Fire. The American heiress and writer Natalie Barney lived a charmed existence as a Parisian hostess, but like this song, there was a powerful, dark vacuum of humanity and empathy at her core. "Big Poppa," Notorious B.I.G. This is an aspirational theme for the Czech novelist Franz Kafka, who would sorely have loved to be the kind of confident, swaggering center of attention that Biggie Smalls claims for himself in this song. "Gute Nacht," Franz Schubert. This is the first song in Schubert's lyrical, melancholy Winterreise cycle about a walker through a frozen landscape of memory and regret. It's first line: "I came here a stranger, as a stranger I depart." This song could only be dedicated to Elliott Smith. "Peter Gunn," Duane Eddy. With its pulsing backbeat, wordless magnetism and sultry, moaning sax, this song is the very embodiment of my sister and hero Nancy Browner. "Once in a Lifetime," Talking Heads. I've given myself two songs because… why not? This has to be the first, since it gave its name to the book and because it perfectly encapsulates the kind of confusion, inchoate yearning and helplessness that characterize the lives of so many people. "Travelin' Light," J.J. Cale. This song is me as I long to be and work towards becoming: carefree, evanescent as a summer breeze and high on life. As Cale puts it: "Travelin' light is the only way to fly… Travelin' light, we can go beyond."